The Swift Camp Creek Trail offers several potential detours, including the Rock Bridge Trail to its stunning namesake. 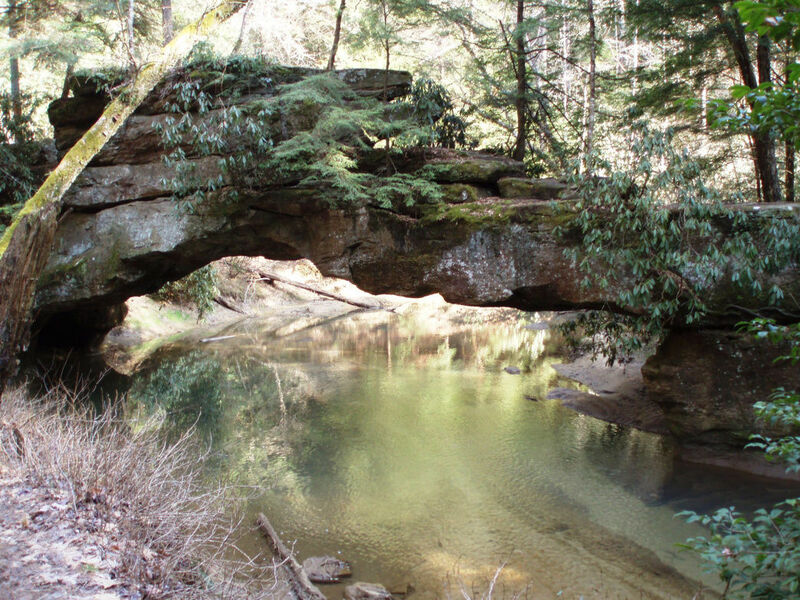 Escape the Red River Gorge crowds with this off-the-beaten-path hike, which, if conditions are right, includes a detour to Hell’s Kitchen. Little trail maintenance, plus constant elevation change, make for a challenging hike. Difficult trail conditions mean you’ll need a full day to see Swift Camp Creek. Avoid the trail in the spring, when runoff can create hazardous conditions or render the trail impassable. The Red River Gorge is world-famous for its rock climbing, but that’s not all it has to offer. Dozens of trails wind through the gorge in Daniel Boone National Forest. Swift Camp Creek is aptly named. You’ll occasionally encounter fast-moving water, so avoid this hike during the rainy and runoff seasons. That’s all part of what gives Swift Camp Creek its adventuresome feel. This trail experiences lighter traffic than many of its neighbors, so it’s a quintessential Kentucky wilderness experience. Between heavy undergrowth, constant ups and downs, numerous stream crossings, and sections of unmaintained trail, Swift Camp Creek offers a real challenge to hikers looking to get away from it all—most of the trail feels very remote. The trail winds eight miles through the Clifty Wilderness from the trailhead at Sky Bridge Road to its junction with the Rock Bridge Trail. There’s a trailhead near the junction at Rock Bridge Recreation Area. This is where hikers with a shuttle meet their pickup. Swift Camp Creek runs alongside its namesake creek for the majority of the trail, but in most spots, steep, rocky drop-offs make creek access impossible. The hike is best done at low water, when it’s possible to cross or hike up Swift Camp Creek. Just before the junction with the Rock Bridge Trail, be on the lookout for the foundations of an old log dam, a remnant of the area’s logging history. When conditions permit, hikers can wade upstream a short distance to “Hell’s Kitchen,” where the forest gives way to huge sandstone walls. Regardless of whether conditions permit a detour to Hell’s Kitchen, you’ll be ready for a beer and a slice of pizza at beloved Miguel’s on your way out of the Red. The Swift Camp Creek Trail is best suited to experienced hikers. Challenging trail conditions—including a lack of signage—mean it’s crucial that hikers be comfortable with backcountry navigation. From Pine Ridge, take KY 15 west to KY 715, where you’ll take a right. Continue for just over 5 miles to the Angel Windows Parking Area. No fees are required for day hiking in Daniel Boone National Forest.